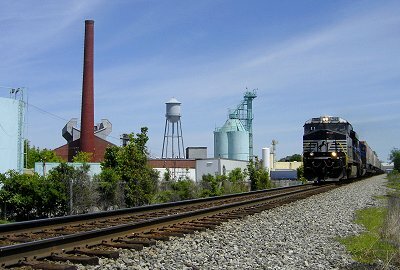 Norfolk-Southern train passes General Electric's Bucyrus Lamp Plant. 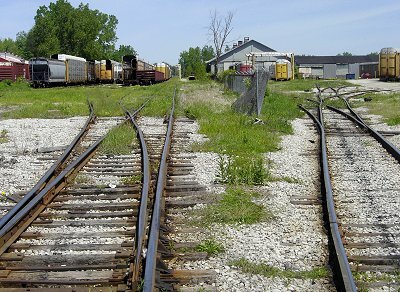 Rail yard in Bucyrus, Ohio, near the facilities of American & Ohio Locomotive Train Company. 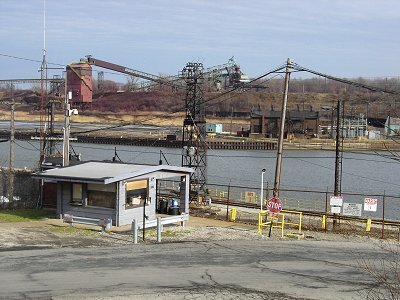 A small part of the Lake Erie port of Conneaut, OH. 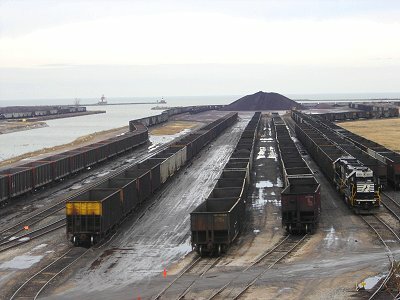 I saw stockpiles of coal, taconite, and stone (limestone?) 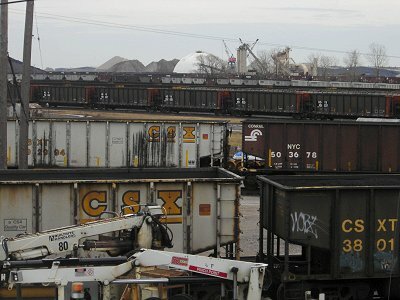 waiting for shipment from barge to train, or train to barge. Another view of Conneaut, OH. 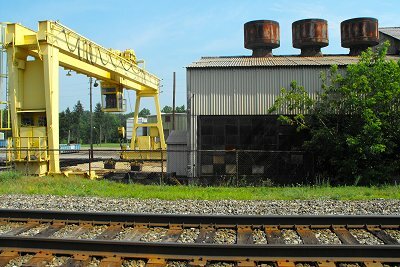 The former Bessemer and Lake Erie Railroad runs from Conneaut to Pittsburgh. 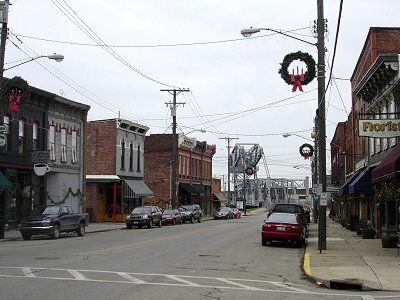 Downtown Ashtabula, OH, with the "lift bridge" in the background. To be honest Ashtabula does has a modern "mall" section of town, but I liked this area of Ashtabula better. 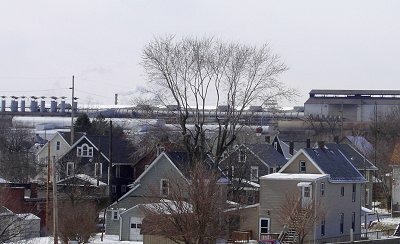 There is also an area of heavy industry east of town that I couldn't appropriately capture with a camera. 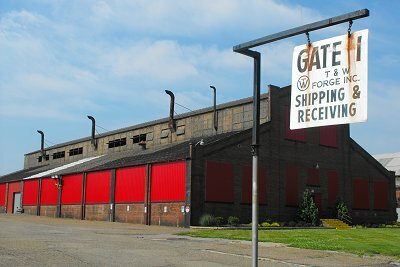 Ashtabula is one of the major ports on Lake Erie. 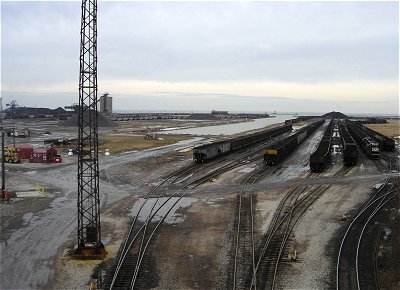 Railroads carry raw materials such as coal, stone, and taconite to and from Ashtabula Harbor. 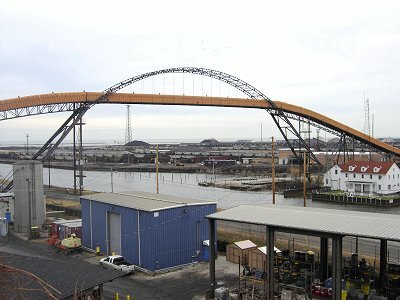 Another view of the Ashtabula port area showing the famous arched conveyor transporting ores and minerals from one side of the harbor to the other. 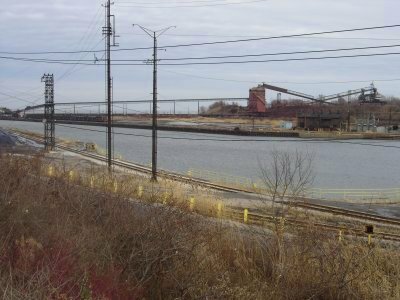 Ashtabula, Ohio harbor is an example of the advantage that the Midwestern Industrial Heartland had, and still has, in barge and rail transportation of raw materials for manufacturing and industry. 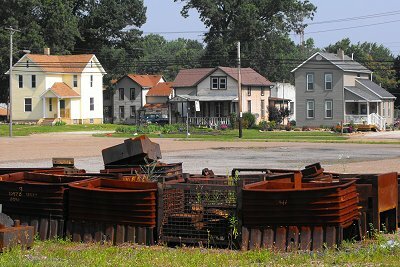 A photo capturing the gritty Rust Belt atmosphere of Canton, Ohio. 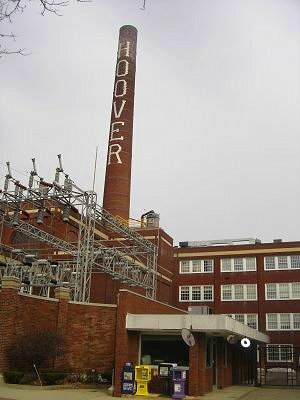 Canton Drop Forge has been in business since 1903. The company has a contract with the International Association of Machinists, and other unions as well. 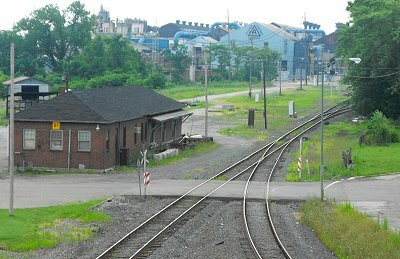 Wheeling and Lake Erie Railway's yard office in front of Marathon Oil's refinery in Canton. 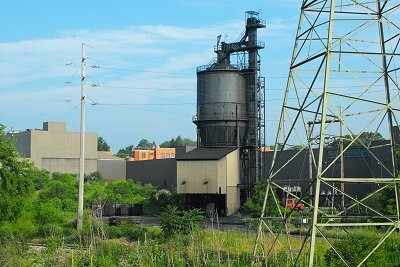 Republic Engineered Products, a descendent of Republic Steel, operates a hot rolling mill and blooming mill in Canton. 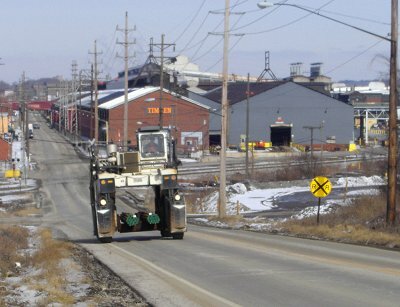 These specialized vehicles carry steel back and forth between Canton mainstay Timken's storage yard and factory, shown in the background. 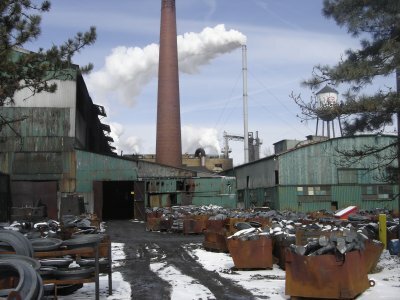 United Steelworkers Local 1123 represents the workers at the Timken plant. 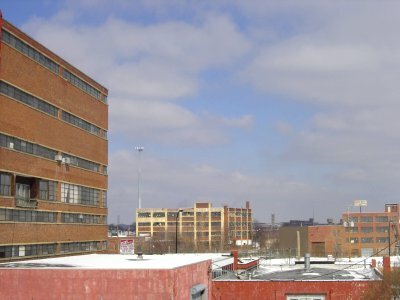 Canton homes with the Timken factory in the background. 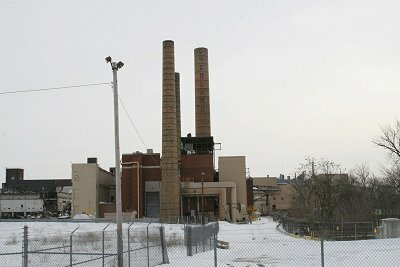 Same old sad story - after years of production the Hoover appliance factory in North Canton, OH was closed down in 2004-2007. International Brotherhood of Electrical Workers Local 1985 represented the workers in North Canton, but probably won't represent the workers at the new factory in Juarez, Mexico. 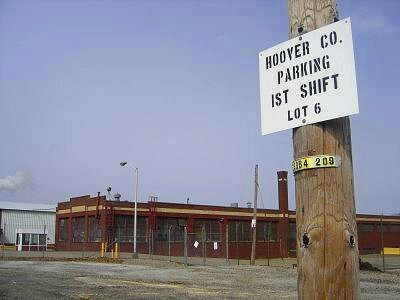 Empty parking lots around the old Hoover plant in North Canton - empty because the employees have been laid off and the equipment auctioned off. R.I.P. 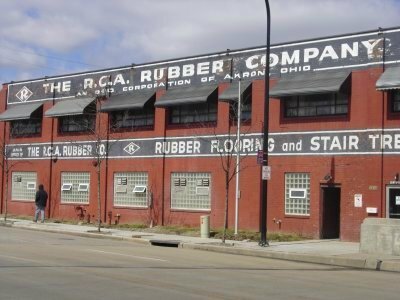 Akron rubber industry - The city was once the "Rubber Capital of the World" containing manufacturing plants of Goodyear, Firestone, B.F. Goodrich, and General Tire. 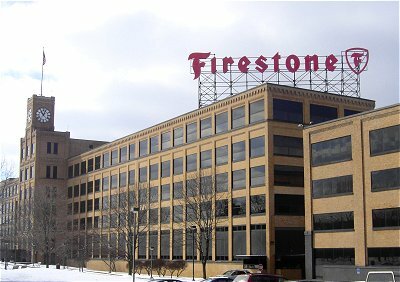 Firestone also operated at nearby Barberton, OH, and Republic Rubber was to the east in Youngstown. Now almost all rubber industries have moved out of the area, leading to the inability of the United Rubber Workers to stand on its own. This labor union which once counted nearly 200,000 members was absorbed into the United Steelworkers union. Another view of Goodyear's Akron complex. 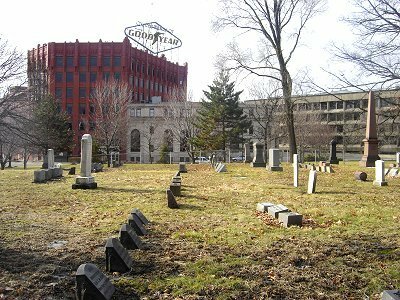 Former Goodyear tire factory and its environs. 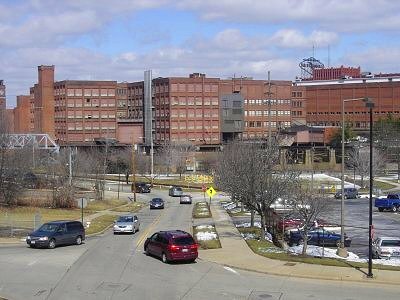 Former B.F. Goodrich rubber/tire factory in downtown Akron. Fortunately many of Goodrich's structures have been remodled into "Canal Place". 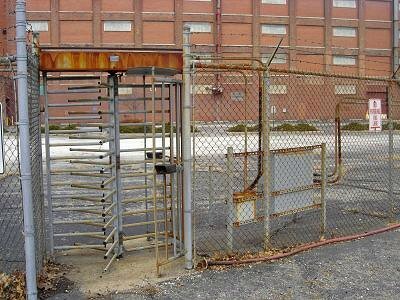 Gate at shuttered B.F. Goodrich plant in Akron. R.C.A. 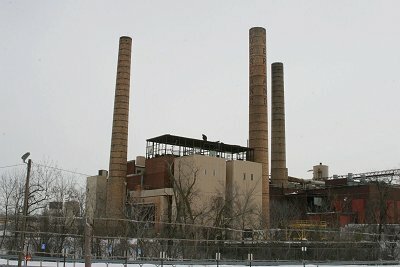 Rubber Co. is one of the last vestiges of a once mighty rubber industry in Akron. The company produces rubber flooring and stair treads. 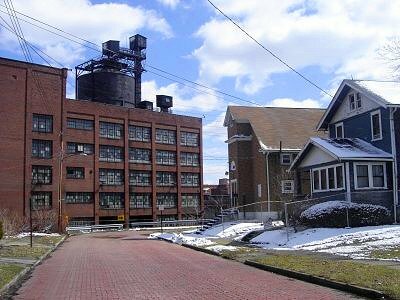 Old industrial buildings in Akron, OH. 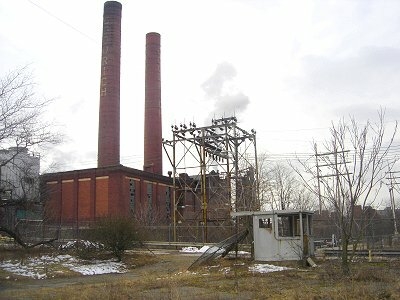 Former Seiberling Rubber plant in Barberton. 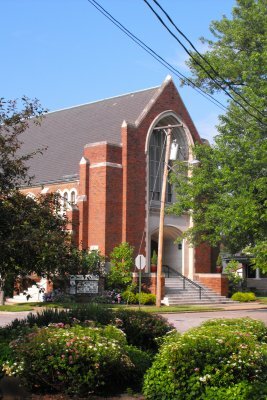 Barberton Ohio's First Presbyterian Church. 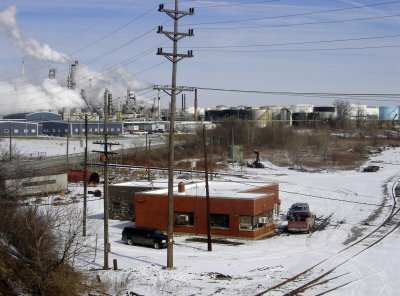 A scene in Alliance, Ohio. 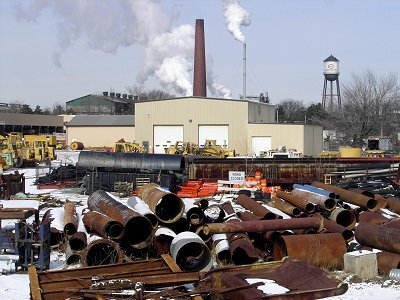 A small portion of the T&W Forge plant in Alliance. 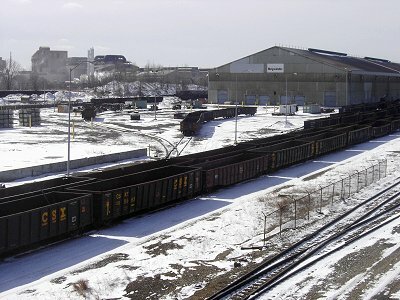 The Norfolk-Southern depot with Alliance Castings Company facility in the background.